BUFFALO, N.Y.--(BUSINESS WIRE)-- Synacor Inc. (NASDAQ: SYNC) today announced Forever Login to curb Pay TV’s password sharing challenges that Parks Associates estimates will be a $10 billion problem. Available on the company’s Cloud ID authentication platform, the new feature lets operators balance easy subscriber access to TV Everywhere content with control over the maximum number of concurrent devices allowed and the length of time before viewers need to login again, if ever. Consumers register trusted devices as part of an operator’s sign-in process, providing access to content anywhere without the need to reenter passwords. When paired with Synacor’s award-winning1 mobile Single Sign-On technology that keeps users logged in across multiple apps, Forever Login clears the way for increased TV Everywhere usage both in and out of the home. The feature is available now and commercially deployed at Pay TV operators in the United States. “We serve an increasingly diverse group of digital consumers who want to watch TV on their terms,” said Scott Young, Director of Marketing at Service Electric Cablevision. “Synacor’s Forever Login is the first tool that enables us to easily enforce fraud prevention rules while improving the consumer experience." Address password abuse. Reduces piracy and fraud by setting an operator-determined maximum number of concurrent streams and failed login attempts, with automated enforcement and attack prevention available. Reduce trouble calls. Password problems are a frequent reason for service calls but can be reduced by eliminating the need to reenter them. Cloud ID’s password recovery makes self-care even easier. Offer easy access, anywhere. 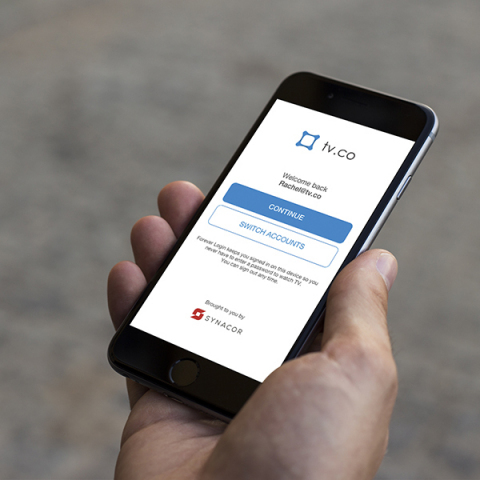 While Synacor’s home-based authentication eliminates passwords for viewers on their operator’s network, Forever Login now supports subscriber logins from anywhere. Empower subscribers. Subscribers can monitor all devices signed in to stream video to spot suspicious activity and remotely log a device out of a service if a device is lost, or a password is stolen. Forever Login automatically registers a user’s device the first time they log into a TV Everywhere app, and continues to authorize video on the device in compliance with operator policies. Whereas all existing authentication solutions require a user to reenter credentials after a set period of time, Forever Login simply prompts users to “continue” to access the app or site they’re using to watch Pay TV. Synacor Cloud ID is the industry’s only end-to-end identity platform that simplifies the subscriber login experience anywhere end users access their video services. Whether viewing in the home via a Wi-Fi network, connected TV or on mobile device, users can get to the services and content they want faster and with less headaches. Synacor is on a mission to improve the consumer sign-on experience. The company’s whitepaper, “Let Them Watch More TV: How to Easily Overcome the Login Problem,” outlines the challenges facing pay TV’s deployment of sign-on solutions, the technical and strategic changes resolving these concerns, and the many benefits of today’s best-in-class simplified sign-on solutions. Synacor’s customers include content networks, satellite, telco and cable operators, and three of the top five virtual-MVPDs. Everywhere/Authentication System for Cloud ID with Apple Single Sign-On.